It seems that as a community, designers tend to be very entrepreneurial. Members of the industry are constantly starting new ventures that are either extensions of their businesses or of personal brands. Some create and sell their own apps and premium WordPress themes, while others start new blogs. A growing number of professionals and companies are also founding new conferences focused on design (sometimes in multiple locations) and reaping incredible financial rewards along with other less quantifiable benefits (such as recognition and visibility in the industry). Perhaps you have attended An Event Apart, FOWA, Build Conference, or any one of these big events and totally loved it. Maybe in your mind you have toyed around with the idea of starting your own event, or even something small-scale like a workshop or meet-up. Or maybe you attended a disappointing event that left you thinking that you could do a much better job. Whatever your reason, the goal of this article is to show you the possibilities and then discuss tips and inspiration on how to host your own event. Why Create Your Own Design Conference? Before I get into how to start your own event, let me first talk about why you might want to do so in the first place. 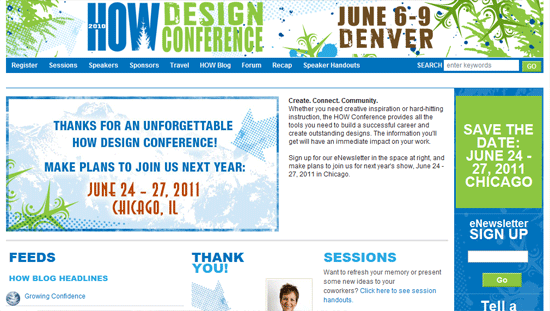 There are a number of reasons why a person or organization might consider starting a new design conference. The most likely reason is that conferences can produce large profits. Why do you think the major record labels are so eager to do 360 deals with new musical artists, in which they take a cut of everything an artist brings in — even revenue generated from gigs and tours, and not just sales of music? It’s because live events are very lucrative — and it’s no different in the design world. We have to look no further than the famous TED conference that charges a whopping $6,000 per ticket and routinely sells out months in advance. Sure, TED is huge and it has been around since the 80’s — but even at a much smaller scale, events can be quite profitable when conducted properly. 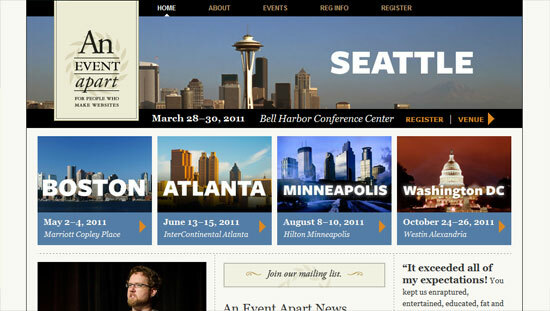 Aside from turning a profit, there any other compelling reasons to start a design conference. If you run a company with one or more mass-market products, like Adobe for instance, it would make sense to establish an event that drives interest in your products and offers hands-on training and tips for your most enthusiastic customers. 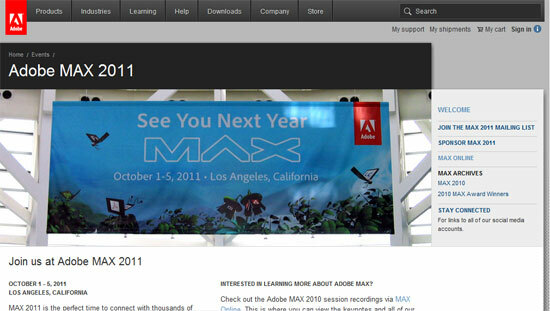 Adobe has done just that with the Adobe MAX conference which focuses on all things digital media. Still others establish events for no other reason than to drive a sluggish industry forward or foster innovation. It’s an approach that makes sense: What better way to tackle a problem than to bring together a group of the best and brightest in a particular field? Not to mention the network-enhancing effects of organizing a conference: Within just a few short months, an event organizer can become an instant social networking maven — both within and outside of the Web — by forging relationships not only with the amazing professionals that attend, but also with the visionary keynote speakers as well. What kind of people or companies are well-positioned to start a new design conference? People with a strong brand and respected companies, for starters. Knowledgeable people (whether solo or in a group) are perfect candidates for starting an event, as are people who are well-connected and have a lot of influence within the industry. 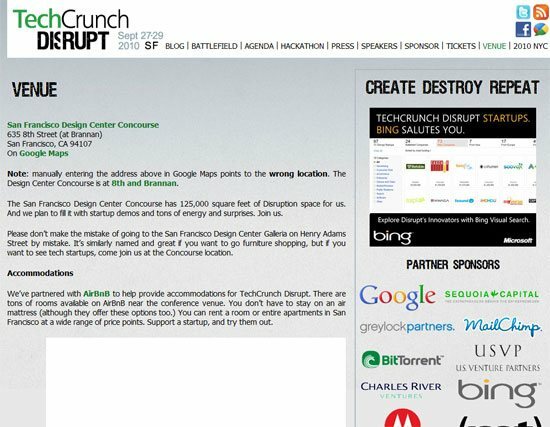 The popular tech blog, TechCrunch, for example, did this with their Disrupt conference. All of this isn’t to say that you can’t start your own conference if you don’t feel like you fit into those categories — you can — it will simply come easier for the types of people I just described. Above all else, a person who is creative and committed can bring a good event to life if they put enough effort into it. Remember, you can always start small and scale up as you become more successful. Before digging deeper into how to create your own event, it may help to look at a few examples of conferences that are already successful. The information that follows gives us a snapshot of each conference: what their website looks like, who’s on-board as a sponsor, the cost to attend, and who the founders are. As your own event starts to take shape, you may want to borrow some ideas and get some inspiration from those who have gone before you. Here is where the rubber really meets the road: Live events, including design conferences, can pull in enormous sums of money. The flipside of making money is that live events, including design conferences, can also lose money (as TED did at its inaugural outing). As you are planning for your event, keep in mind that tickets sold do not equal pure profit. You have to pay for expenses such as renting a venue and paying speakers. Let’s take a hypothetical look at the possibilities of making a profit using the ticket prices of the events I listed earlier in this post. For the purpose of illustration, I’m going to arbitrarily pick a few numbers out of the air. First, let’s assume that there will be 200 people attending each hypothetical event below. Next, let’s hire two keynote speakers and assume that it will cost $1,000 per keynote speaker. Finally, our hypothetical event is going to last for 2 days and it will cost $2,000 per day to rent our venue. In real life, we’d also have other costs such as marketing expenses or hiring an event-planning company to bring it all together, but for our purposes, I’m keeping it rather simplistic. Wow! That’s a lot of money, right? As previously stated, this is a pretty simplistic demonstration of possible profits, but it should still give you something to think about. Your ultimate success or failure will depend on many things including your organizational skills, your ability to rally others to your cause, the quality of your sales skills, your professional network, and so forth. To determine what the price of admission should be for your event, you need to place yourself in the position of the person who will be responsible for shilling out the money. This, of course, is going to depend on your target audience. An individual that comes from a freelancing background might view a $1,000+ ticket as outrageously overpriced. A medium-to-large business manager, however, may view this as an affordable investment — a way to keep employees up-to-date without paying for costly continuing education classes at a nearby college. As you can see, words like "expensive" and "acceptable" are all relative. Digging a little deeper, it’s possible to examine why it makes sense for a couple of the previously mentioned events to charge what they do. 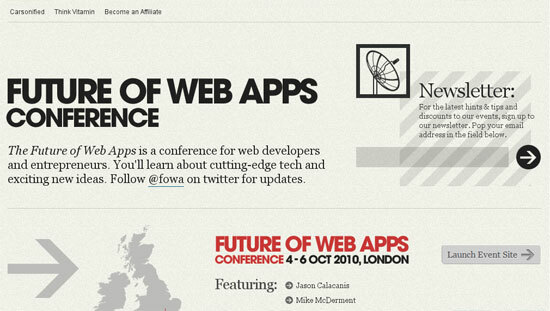 Let’s start with the Future of Web Apps conference, or FOWA, run by Carsonified. If you think about the target audience of web app developers, there exists a wide variety of possible attendees ranging from large companies down to work-at-home freelancers. Most people interested in attending a conference like this fit into the small business or freelancer categories — in other words, people with smaller budgets — because the barrier to entry in this market is so low. We can also get a feel for the audience by taking a look at the sponsorship: PayPal, MailChimp and Squarespace are all services used by smaller-sized companies. So, a price under $200 makes quite a bit of sense for this particular event. Now let’s examine the Adobe MAX event. The sponsors of this conference are much, much bigger than those sponsoring FOWA: Google, HP and Intel to name just a few. Yes, these three companies make products used by small- to medium-sized customers; however, they are going to spend their money marketing to big buyers. The attendees of events like Adobe MAX are most likely sent all expenses paid by their employers who want to equip their employees with knowledge that will give them an edge. Therefore, a price tag of $1,695 is quite understandable. While tickets will most likely be the main source of revenue generated by your event, there are a few other ways to make money as well. Sometimes you can get sponsors to pay you money to put their logo on all of your marketing materials (and sometimes sponsors just donate something, like printing). Another valid option is to sell merchandise to the crowd: shirts, bags, hats, and the like. When it comes to creating a live event that people will enjoy and that returns a decent profit, the key to success is making it worth the while of all involved parties. This includes you, the sponsors, the speakers and presenters, and, of course, the attendees. To be sure, you don’t want to bite off more than you can chew, so start small and scale up when you’re ready. Above all else, don’t waste people’s time or money. To make sure the event is worth it for yourself, you may need to brainstorm a list of goals and see how they can be met. Putting together a live event can be a lot of work so ask yourself if the potential positives (like making money) outweigh the potential negatives (like taking time away from day job). To make your sponsors happy you’ll need to connect them to your audience. Usually this comes in the form of putting logos on stage banners or event programs or making announcements like, "This presentation is sponsored by…"
If a sponsor is paying money to get in front of your audience, make sure they actually get in front of your audience. If you don’t, you can bet that sponsor won’t be back next year. If you do, it could be the start of a long and mutually beneficial business relationship. What’s the best way to make an event worthwhile for the speakers and presenters? Pay them a fair amount and make sure they are well taken cared of. Most popular speakers have riders (or contracts) in place to assure they are paid a proper amount and have access to things like food, a quiet room to prepare in and other similar privileges. It’s always nice to give your speakers free access to the rest of your conference as a perk (in fact, it’s probably assumed). Perhaps most importantly, your event must be worthwhile to the attendees. These are people who have probably traveled a good distance, have given up time from their regular working schedules and who have paid a hefty fee to attend. They deserve to be wowed. They deserve to get what they have been promised. Keep in mind that you are fostering relationships with all the parties mentioned above that will either help or harm your chances for success in the future. If you do your very best to deliver the goods, it will indeed be completely and totally worth it — for them and for you. If you paid close attention to the events listed above, you may have noticed that each event caters to a niche. 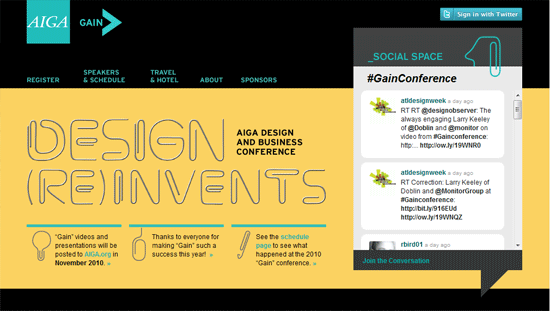 The AIGA Gain conference is all about design and business. An Event Apart drills down past the crust of general design to focus more specifically on web design. 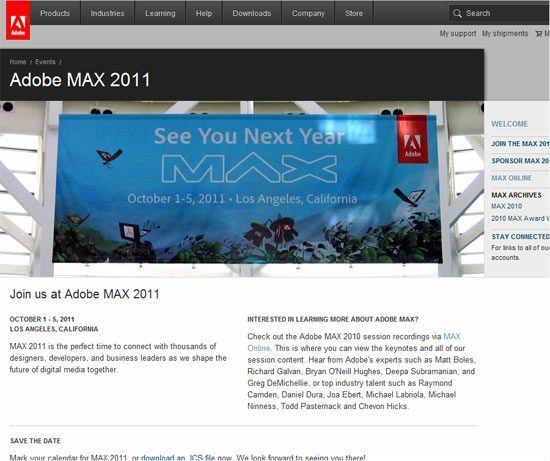 Adobe MAX is all about digital media while TED adds technology and entertainment to the mix. You get the point. To create a successful event of your own, you’ve got to go where the opportunity lies. To find out where the opportunities are, you’ve got to do some research. Was there anything missing from a recent event I attended? What group of people in my area would benefit from information I can easily deliver? To sum this idea up: If you can identify a problem, you may just have the beginnings of a new design conference. So what niche will you serve? You’ve got to analyze the market across the board. Let’s say you are an expert in developing web apps. Well, just because a conference already exists that deals with web apps doesn’t mean there isn’t room for another player. For example, FOWA was only held in two locations: London and Las Vegas. That means that, geographically speaking, there are plenty of opportunities to establish an event that covers a similar topic somewhere else. While important, location is not the only way to distinguish and entrench your event. Maybe a good conference has not been set up for a new technology or perhaps a certain group of people (e.g. freelancers, church marketers, people looking for a new career, or students) could use an annual professional boost. The possibilities are endless. Just remember: you’ve got to be able to make your event worthwhile to your target audience or it just won’t work. Keynote speakers are not only the engines that will drive initial interest in your conference but also create the electricity in the air (or a lack thereof) during the actual event. Your keynote speakers will largely be responsible for the overall satisfaction that attendees get after the event. In other words, they have the ability to anchor your event. Getting a good keynote speaker is a little like planning a baseball lineup: you stick your best hitter in the 4th position with three other good hitters in the first 3 slots so there is a chance to hit a grand slam. Everyone else goes after. In other words, they are the highlight of the conference and you should plan everything else around them. Whatever the size of your budget is, you’ll probably spend most of the money you’ve set aside for speakers for the keynote speaker. While keynote addresses are typically the "meat" of conferences, breakout sessions should not be treated lightly as fillers or as if they are any less important. A keynote speaker may talk for 15 minutes or 2 hours — regardless, you’ve got to have plenty of high quality material available to fill up the rest of the time in a meaningful way. Again, your goal should be to not waste anyone’s time. As mentioned before, it’s a good idea to plan your conference around the messages of your keynote speakers. Use your breakout sessions to supplement the information given out (or not given out) during the keynote address. Do you anticipate that people will want to learn more about a certain subject? Create a breakout session for that purpose then. Let’s say your conference is about photography and your keynote speaker will be talking about how to take great photos. You might have a breakout session on picking the right camera or equipment. Whatever you do, your choices of material for your breakout sessions need to make sense. It’s better to give people some free time to catch up on sleep or do some sightseeing than make them sit through a boring speaker or topic for 2 hours. Let’s get this out of the way first: if your target audience is designers, by no means can your website and marketing materials be construed as poorly designed–for obvious reasons. You’re a creative person, so get creative with your marketing materials. As you are well aware, the internet offers cost-effective marketing opportunities. As such, you need to put a lot of effort into making your website not only a place to register but a good resource as well. 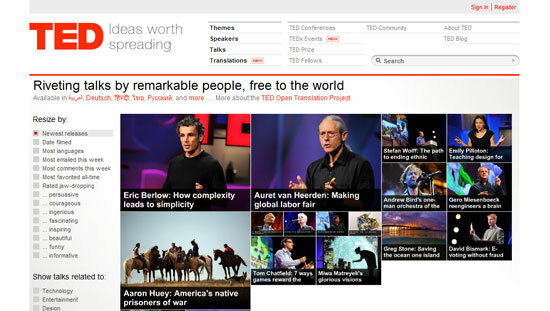 It’s a well-known fact that TED makes every talk ever given at the conference available for free online. This might seem counterintuitive in terms of ensuring that people attend the next conference — if you can see it free online, why shell out the dough? — but it actually has the effect of generating more interest. 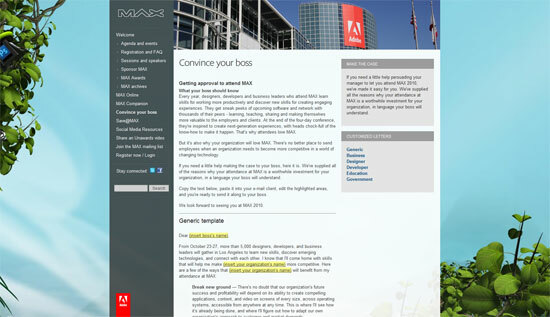 The Adobe MAX website has a convince your boss section of the site that contains tips on how to get your boss to send you to the conference along with a generic template you can copy and paste and send via email. Aside from a great website, how you decide to reach your target audience is going to depend largely on the type of people you are trying to get to your conference. If you are part of a large national organization, it might be fairly easy to let people know about your conference via email. If you are a work-at-home freelancer, you may need to get extra creative or spend some decent money to create awareness. Networking opportunities are a top draw of design conferences, and as such, creating excellent networking opportunities should be a top priority of any conference architect. Luncheons, dinners, picnics, banquets and other ways to get people to eat together are always great ways to facilitate networking. Not only do meals give people a little extra time to spend together, but the food gives people a nice break from any potential table mates that talk too much. When people leave to find food on their own, that’s one less chance to meet and greet new people. Tours are another great way to get people to interact in a casual atmosphere. 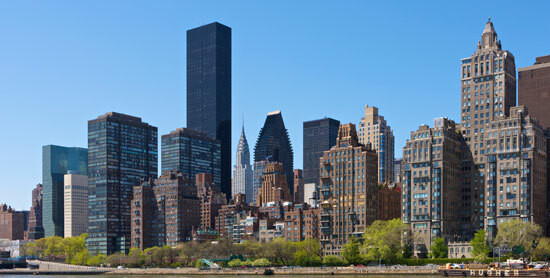 Many design conferences take people on tours of local advertising agencies and creative shops. Not only does this inspire attendees by showing them cool working environments, but it allows them to sit next to someone they don’t know on a bus and strike up a conversation (Oh no, I hope that guy doesn’t sit by me…). Providing snack and refreshment stations is another great way to facilitate networking. Put a hydration station at the back of each breakout session room or setup a pastry table in the main lobby. The more chance encounters you can create, the better. Picking a great geographic location and venue are crucial to creating a great conference experience. Pick a location that’s got an element of entertainment to it: the beach, a ski town, a city with plenty of attractions — stuff like that. Don’t pick a place where the main attraction is a farm with a little gift shop. Make sure people will have something fun to do; either during their downtime or in case people want to stay a little longer for some vacation time. Oh yeah, make sure to avoid crime-riddled neighborhoods so people can walk around as many won’t have cars and will have taken a shuttle from the airport. To save money, it’s a good idea to hold your conference in a nice hotel so you don’t have to rent a separate venue. Read reviews and get recommendations. Just because a hotel was once rated with 4 diamonds doesn’t mean it hasn’t since deteriorated. Many hotels are set up to specifically attract conferences and have the facilities you’ll need including plenty of space, large screens and projectors and sound systems, but double-check to make sure they can provide everything you will need. It’s a good idea to make sure your hotel has a 24/7 airport shuttle as well–I say 24/7 because some hotel shuttles won’t run during the early hours of the morning. Food is another consideration that many conference organizers don’t take into account. You’ve got to assume that people are going to have different needs when it comes to finding food in the surrounding area. It’s easy to think everyone who attends will want to eat what you want to eat, but the truth is you will have a wide variety of eaters: carnivores, herbivores and omnivores (and who knows what else). What does this mean? Make sure there are plenty of restaurants within walking distance from your chosen venue to give people options. Thanks to the internet, many events extend beyond the conference itself. 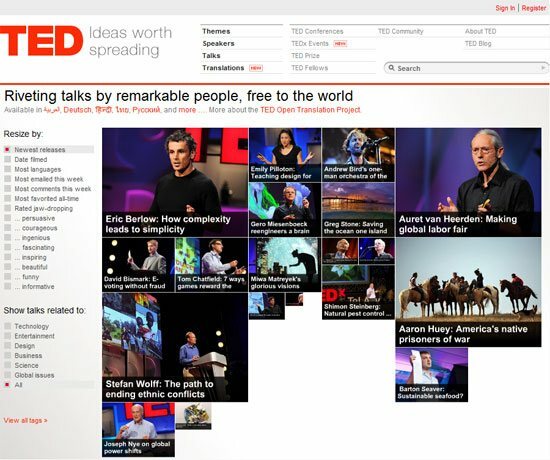 As I mentioned earlier, TED makes every talk available in video format for free on their website. Why? It drives interest in the event and, in a sort of philanthropic effort because the conference is nonprofit, it allows people who are not privileged enough to actually attend the event in person a chance to learn. If you wanted to take a different approach to event video, try selling access to it after the event has finished for people who either want to see it again or didn’t get to attend. If you plan correctly, you can setup a Flickr group and tell people to upload their own pictures for people to view both during the event and also when the event is over. Video and photos are both great ways to get more mileage from your event after it’s over. A lot of conference use Twitter hashtags (such as #ted or #fowa), which is great for following events in real time.